things writen by kaijuuaoiro: robot with emotions ? This is how people is deceived, even could them scientist believe they can make a robot with emotions? if I go to watch a movie and the actors cry, it means the cinema had emotions? 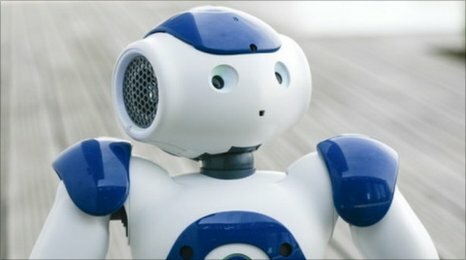 Scientists from the University of Hertfordshire have unveiled a new robot which they claim is the first to be able to develop and show emotions. Part of the Feelix Growing (Feel, Interact, Express) project, the robot has been created as a potential 24 hour companion for children in hospital. Named Nao, the machine is programmed to mimic the emotional skills of a one-year-old child. It is capable of forming bonds with people when treated with kindness. The robot has been developed by a team of scientists from eight different universities and robotics companies across the EU, including a group from the University of Hertfordshire at Hatfield. When the robot is sad it hunches its shoulders forward and looks down. When it is happy, it raises its arms, looking for a hug. When frightened, it cowers and stays like that until it is soothed with gentle strokes on the head. The relationships Nao forms depend on how people react and treat, and on the amount of attention they show. Nao uses video cameras to work out how close a person comes to it as well as sensors to judge how tactile they are. One of the aims of the project is to provide 24-hour companionship for young children in hospital and to provide support for their parents, carers, doctors and nurses. "Our goal was to create companions who can live with people and support them in daily activities. We want them to live socially and emotionally, to become adapted and to do things in the way humans expect them to," said Lola Cañamero, a computer scientist at Hertfordshire University. "This behaviour is modelled on what a young child does. "This is also very similar to the way chimpanzees and other non-human primates develop affective bonds with their caregivers," said Dr Cañamero. The researchers led by Dr. Cañamero at the University of Hertfordshire are now extending the prototype further and adapting it as part of the EU project ALIZ-E, which will develop robots that learn to be carer/companion for diabetic children in hospital.